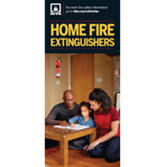 Drive home the proper way to use portable fire extinguishers to put out small fires in the home, prevent injuries, deaths, and property damage! Pass on these great tips to everyone in your community! Help demonstrate in a simple, concise way with detailed photos and clear, easy-to-understand instructions in four easy steps, how to correctly use the P.A.S.S. technique (Pull, Aim, Squeeze, Sweep) to put out small fires...and prevent them from becoming big fires with catastrophic losses and injuries. Four things everyone must know before fighting a small fire with a fire extinguisher. How many seconds it takes before a portable fire extinguisher completely discharges. The best choice for a home fire extinguisher. What one label to always look for on a fire extinguisher. Why you should never use a multi-purpose extinguisher on a pan fire.